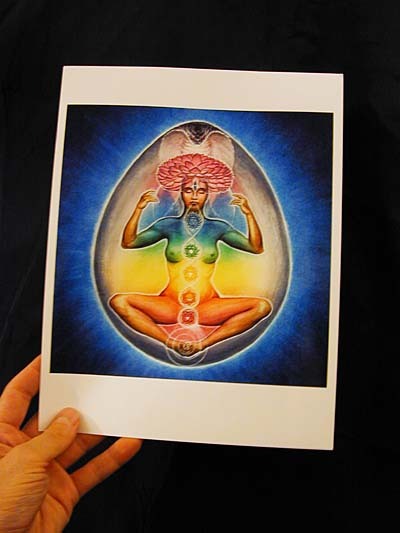 The reproduction technique is giclee (photo-quality inkjet) on heavy, ultra-premium, luster stock. We print with the highest quality pigment-based Ultrachrome inks for long life and brilliant colors. Like any art print, these prints should not be exposed to direct sunlight or water. They should be framed behind glass or clear film for optimum vibrancy & life. More print details here. See the Order Form for pricing. Photo of 'Format' type frame, approx. 8.5" x 11"
Most of my paitings are either square in shape -- framed vertically as you see here, or slightly "landscape" (more wide than tall), in which case I frame them horizontally. 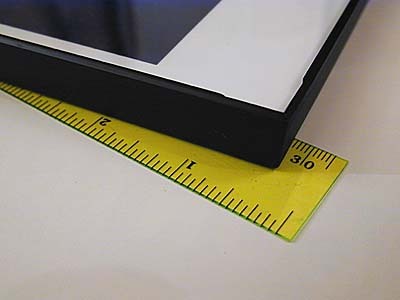 Detail of "Format' type frame showing half-inch thickness of the frame and the corner edge where the front-loading glass inserts. Frame can be hung horzontally or vertically; or optionally, stood on a table (a fold-out leg is attached). Photo of a large print, minimum image size 12.5" square on 13" x 14" premium luster (pearl surface) photo paper. We use the highest-quality pigment-based Ultrachrome inks for long life and brilliant colors. 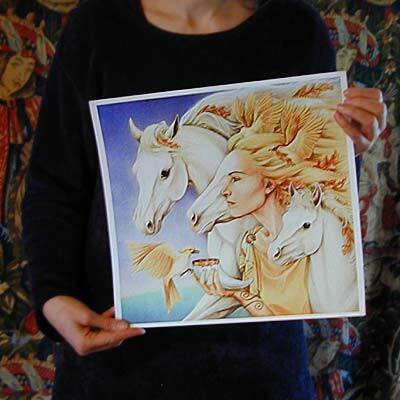 Non-square images are slightly larger; Rhiannon, shown here, is 13.5" wide by 12.5" tall. The paper stock instelf is 13x19" before trimming. 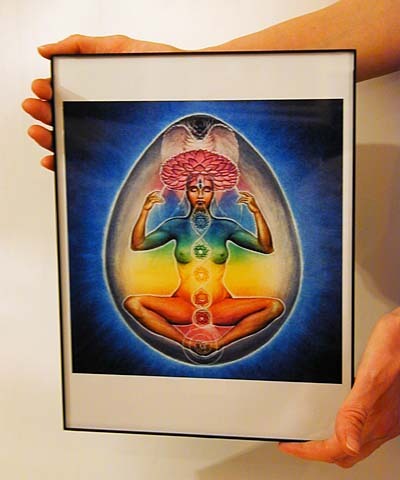 Large prints are shipped flat, in a double-thick cardboard mailer, unframed. See the Order Form for pricing & quantity discounts. 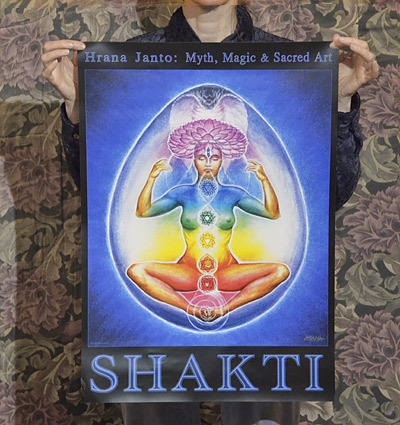 Photo of a new POSTER, full-color offset-printed on 100# paper with an acqueous gloss coat (this is thinner stock than the art prints, narrower gamut, similar to magazine-quality color printing). Paper size is full 19" x 27" with images varying by layout. Beautiful enough for framing, inexpensive enough to pin directly on your wall! Posters are shipped rolled in a protective mailing tube. See the Order Form for pricing. NOTE: All Goddess images by Hrana Janto are Copyright 1991-2017 ~ all rights reserved. Other book Covers copyright their respective Publishers. Please do not copy or redistribute any text or images without first obtaining permission. Thank you.